Saturday, October 4th was half a re-positioning day. Remember I call a day a re-positioning day when I “lose a day” and maybe transit a horrid turnpike setting myself into position for some serious shunpiking? Well, today I left a tad before 8AM to cut across Vermont, scoot over to Troy, NY, and cross the Hudson to pick up I-87 (sorry) to get onto (really sorry) the New York Thruway — but only to Exit 39 where I was going to pick up NY 31. I arrived at my starting point at 1PM, Baldwinsville, NY, in the pouring rain, ready to travel the next 80 miles that ending up taking 4 1/2 hours – not bad. 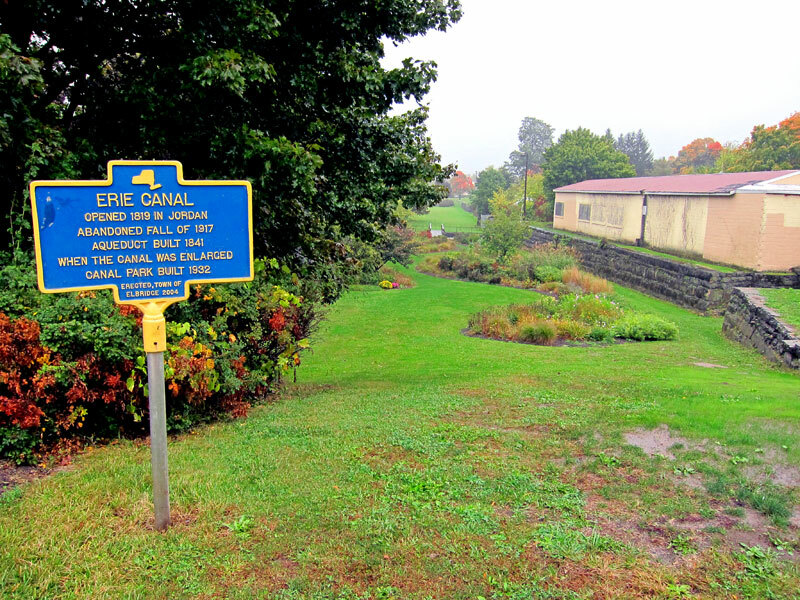 One goal of this trip to East Aurora, NY, is to visit the western parts of the Erie Canal. 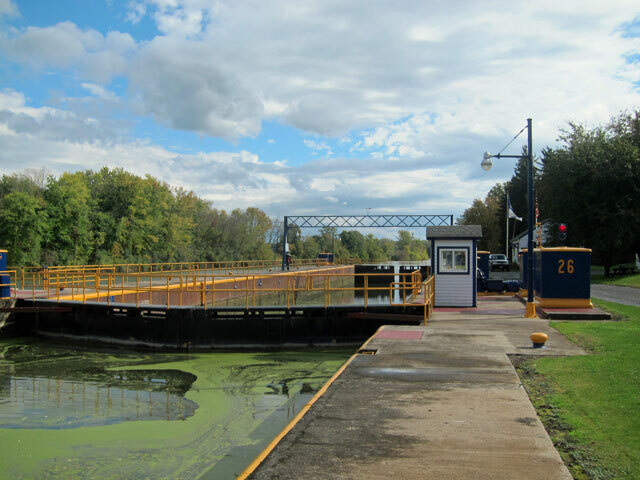 In Fall, 2008, I spent 3 days on a canal boat from the Hudson to Oneida Lake. That was my first excursion after loosing Cathy, and learning about the Erie Canal has been on the list for decades. It was fun, but now I have to follow the canal along the backroads to get the full flavor. The New York State Thruway essentially follows Clinton’s “Big Ditch” completed in 1825, which was replaced in 1918 with the 525 mile NY State Barge Canal system. 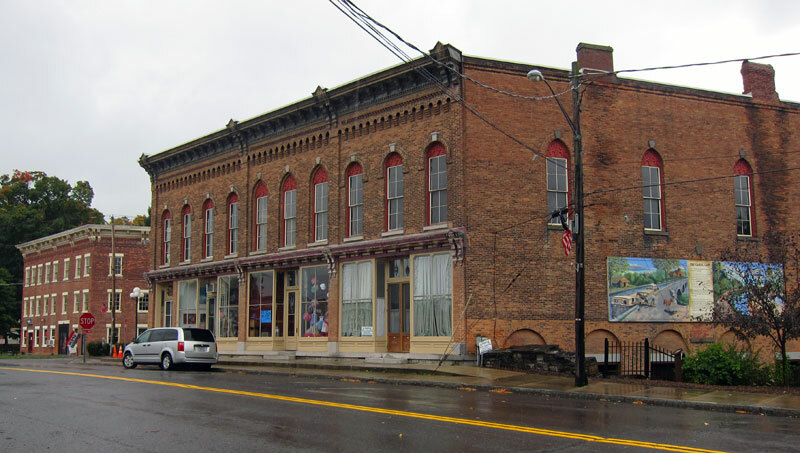 The economics of opening up New York state and the west is fascinating as well as the rise and fall of canal’s port towns, a few of which I experienced today. The canal in the western part of NY follows NY Route 31 mainly (or visa versa). In case you are not as enthralled with old modes of transportation as I am, some of today’s images will be in galleries, and you need not click to open larger sizes if you prefer. So off I headed shunpiking on NY 31 coming first to a sign for Jordan which required shuning the shunpike to turn into the town. (RAY RECOMMENDS — always turn at the sign that says “business district” or the like — a great “business district” can be but 5 or 6 Victorian buildings). And, here I began to start finding old and new canal features, beginning with this former aqueduct through town. To the west of town, the “new” locks that essentially took business from the town. A double lock was needed to speed up the flow of traffic. This “private museum” (now abandoned?) used to be open Fridays from 6 to 8. Another small sign led me south to the connector canals in Montezuma (no not Mexico) to the Finger Lakes. In Clyde I followed the signs to Lock 26 heading way out through farmland and down a dirt road to a remote spot. In case you have not seen a lock before, I wanted to share this series with you. 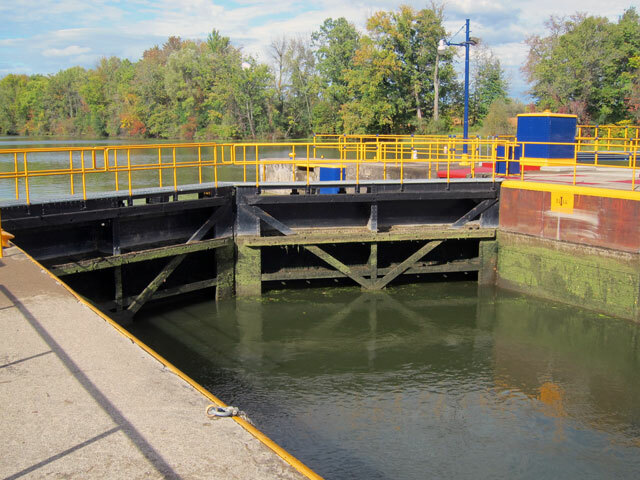 Lock 28 is just a tad further west and close by is the old Lock E-56 which at one time due to increased traffic and to be double up to alleviate the bottle necks. 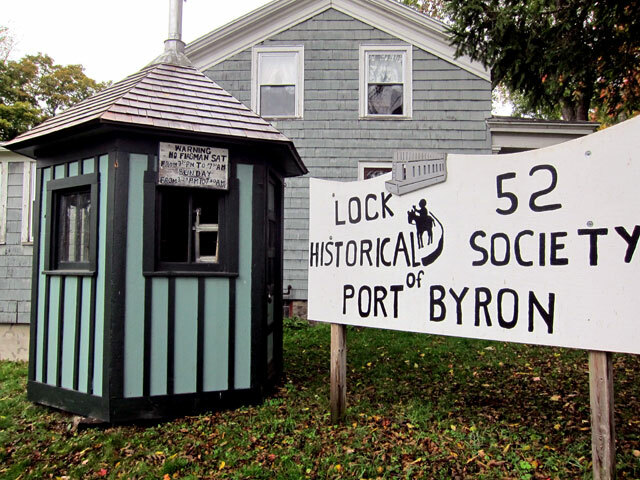 Old Lock E-56 (with lock master’s house in background) . Two sets to speed traffic. By 6PM I was out to explore the city. Fortunately, I turned the wrong way (odd for Ray) and did not realize I was headed north ending in the beach area on Lake Ontario. Fortunately I realized it before my front tires got wet. I turned around and headed the other way on Lake Avenue, of course, towards downtown. 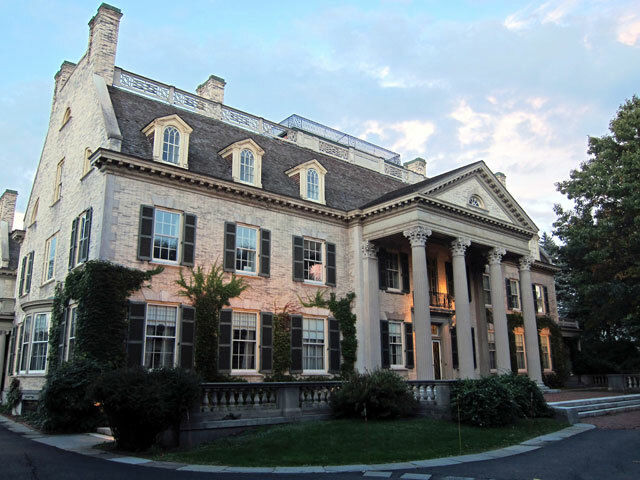 I needed to see the George Eastman House, which I did, but had already decided that since it did not open until 11AM Sunday that if I went I would get too late a start for East Aurora. 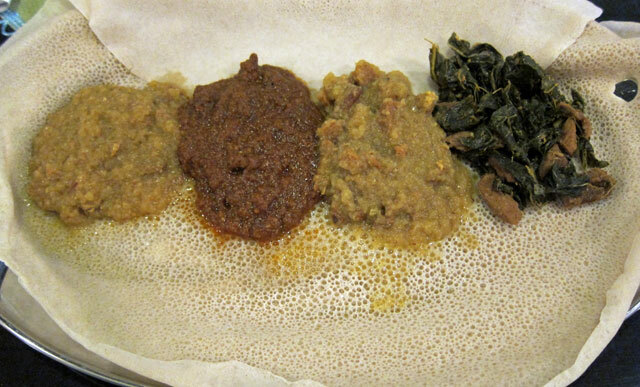 I am spending the night in Rochester in a B&B, and my hostess said, “try the Taste of Ethiopia,” and I did. I had no idea what to expect at all, and was I ever pleasantly pleased. Where does one begin when you do not know the foods? A sampler plate, of course. So with my Ethoiopian server’s assistance I made 4 choices for the $15 sampler plate, which arrived in no time. Placing it in front of me she asked, “do you know how to eat this?” “No, but please tell me.” “You pull apart this crepe like bread and scoop up the foods,” she told me. I asked for napkins and a fork in case. I never touched the fork! Read the other reviews, they are great. All I can say is try the experience, you will like it. Sunday morning was a breakfast delight with my B&B mates. One and a half hours over Rene’s baked oatmeal with pears, raisins and walnuts. Satisfied me until dinner. 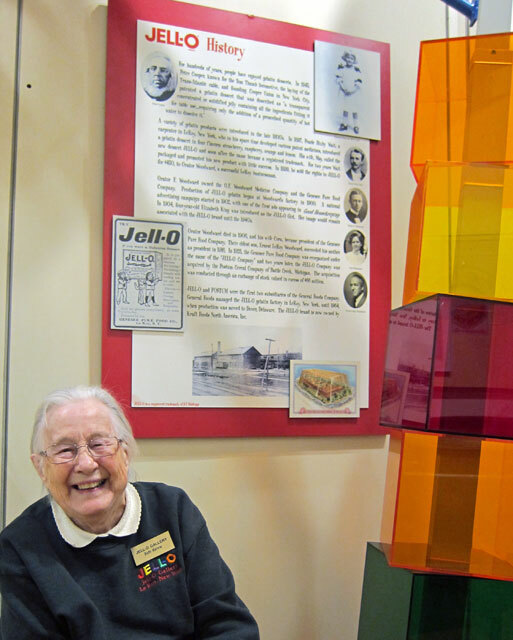 Two items on Sunday’s agenda – The Jello Museum in Le Roy and the Genesee County Village and Museum in Mumford, NY. For over a decade I have read and reread the book I have about this restored village, and now I was a half hour away — yes, of course! And, Jello Museum? How can you resist? I stopped first at the Jello Museum (just minutes from Exit 47 of the NYS Thruway) but had misread the opening time (Ray is slipping). Have to come back at 1PM. So off I headed to the village. Well — FORGET STURBRIDGE VILLAGE in Sturbridge, Mass. Make the trek here. I cannot wait to bring grandchildren. 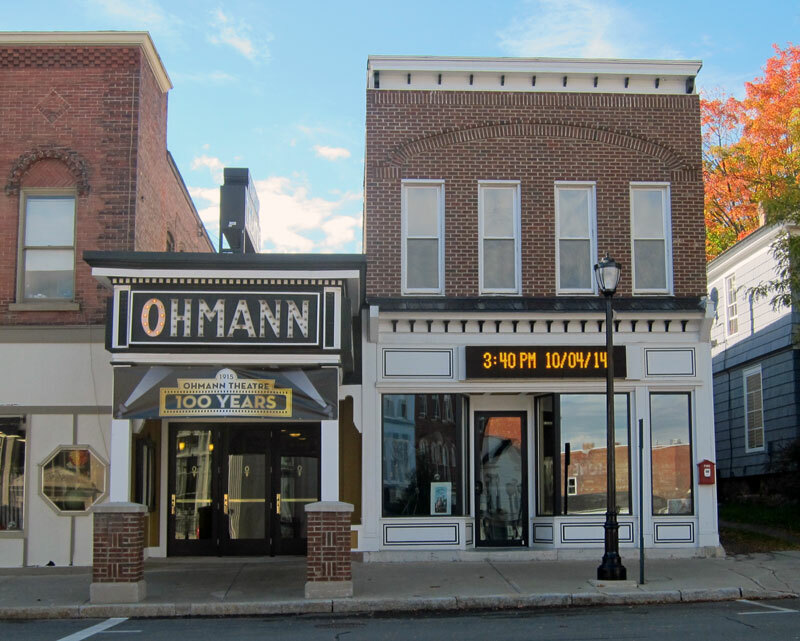 Having been to many such museum villages this, I declare, to be the best for docent interaction and interpretive presentation of several time periods. Buildings have been relocated here in appropriate and traditional settings. In some cases a building has been reconstructed based on historical evidence, or repurposed – interpreted differently from its original use (e.g. the print shop). The village is set up in three sections that flow well together: Pioneer Settlement (1780s-1830s); Antebellum Village (1830s-1860s) on its common (I felt like home); and, Turn of the Century (1870s-1920s). I will not go into further detail, but here is a “slide show” you can open up by clicking. Just visit when you can. I started at the Octagon House in the Victorian village area. One room in the Octagon House. Efficient use of space and air flow, especially through the center and out the cupola. Note John Rogers statuary, Council of War. Making dye in a pumpkin. I still need to make a floor cloth for my dining room. Looking out the tavern window. The agricultural festival on the town common. And, then I got back to the Jello Museum as it was opening. Ruth starts you off, and she is a delight. Allow about 45 minutes for this small museum which has a separate transportation collection on the ground floor. So, if traveling on the NYS Thruway, make the stop at Exit 47. And since you may never make it, enjoy the gallery below. Next group listening to Ruth. 908 Cadillac in the transportation museum. You know I love cars in original unrestored condition. 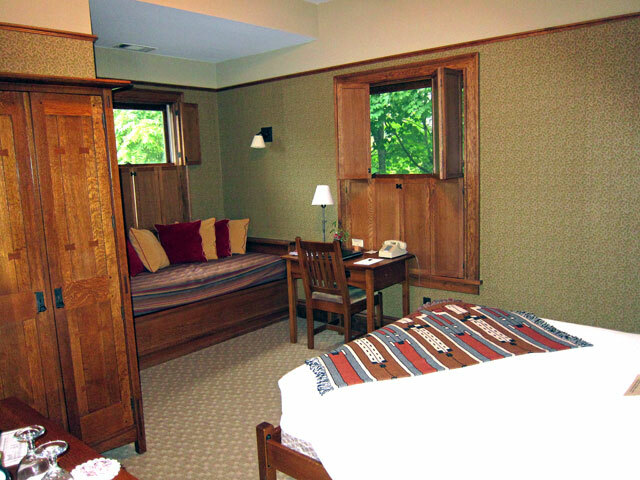 I arrived at the Roycroft Inn at 3:30 got settled and showered before the 4PM welcome started. A fine dinner was followed by an 8 PM meet and greet and orientation prior to the activities commencing on Monday. As I like to do, here is my room and some of my surroundings (more on it all next post). The Gray Ghost parked outside the Inn. Salon of the Inn during registration. Sitting area in my wing. 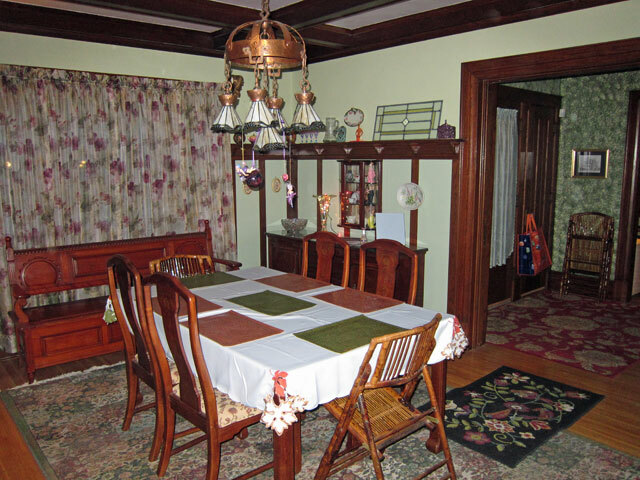 This entry was posted in 2014-d - ROYCROFT EXPERIENCE (and more) - 4-12 October 2014 and tagged East Aurora, Elbert Hubbard, Genesee County Village and Museum, Jello Museum, Mumford, NY, Roycroft. Bookmark the permalink. Wow, Ray! 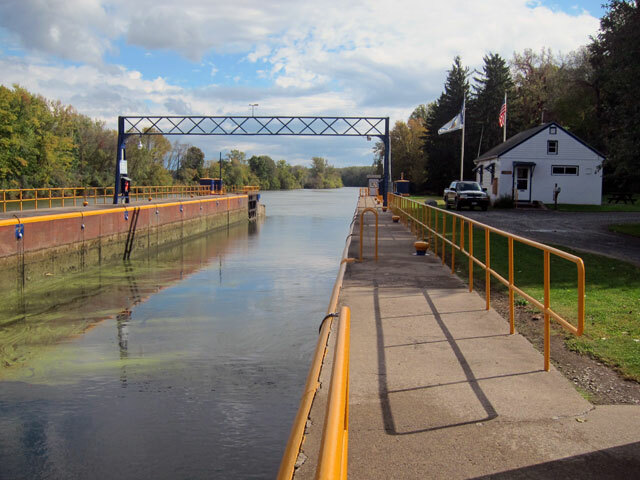 Loved this post; I can tell how long it must have taken to write this but this post brought me back to our trip to Sault Ste Marie and also New Berman, Ohio where we had fun discovering all the locks along the canals in the area. As for your “traveling show”, I say go for it… you already have the top hat! 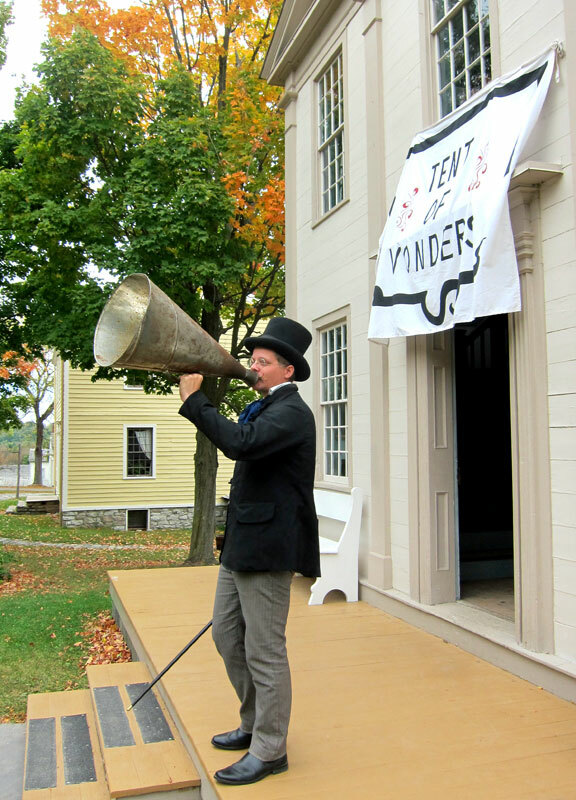 You also have me intrigued with the Genesee County Museum as we really like Sturbridge Village over Williamsburg. Guess we now have another place to visit.